Forgiveness won’t change what’s happened, but it will change what will be. We pick up right where we left off last time with Roger still getting beaten up like a sad bearded pinata. One of the Mohawk men stops the ritual and declares that Roger shall remain a prisoner. A young Mohawk girl tugs at Roger’s beard and calls him something. The rest of the tribe finds it funny and starts calling Roger by the same word. Fergus informs two fellow Regulators that Murtagh has been arrested. All of them know Tryon will prevent Murtagh from having a fair trial. Fergus will not let Murtagh hang. I love the glint of determination in his eyes. I get why Brianna wants to see Bonnet. I also think it’s a trademark terrible idea. But I get it. So does Lord John. We finally get to hear what Jamie wrote to Brianna in the letter from the last episode. Not only is it the best advice he could’ve offered Brianna as a fellow survivor, but it’s also great advice coming from a father to a daughter. He’s not saying that Bonnet deserves forgiveness. Brianna deserves to forgive herself. She also realizes she never said goodbye to Jamie. Meanwhile, Roger is treated to a rare act of kindness in Shadow Lake. A young Mohawk woman named Johiehon asks if he speaks French and offers him an herb to chew to help with his pain. Roger compliments her on her beautiful baby. She mentions how her child has his father’s eyes. Kaheroton intercepts the two of them. He obviously has feelings for Johiehon. You can’t blame him for being suspicious of a man sold by his own people. I loved seeing the anger in his eyes change rapidly to love the moment he was alone with Johiehon. We must remember that peace begins here, as war does, in the minds of men. You are impossible not to like. Brianna/Lord John was the friendship I didn’t even realize I desperately wanted. While he sees Claire and Jamie in Brianna’s spirit, he also respects her as her own person. Poor Roger. Kaheroton clearly is jealous of him now and he seizes on the chance to pick on our bearded historian. Johiehon comes to Roger’s defense but to no avail. Roger is sentenced to the hut of shame for troubled white guys. Kahereton gleefully drags him there but asks with genuine curiosity where Roger’s loyalties lie. Once thrown unceremoniously into the hut, Roger meets Alexandre Ferrigault. Roger’s fellow white guy continues to heap good news on Roger by telling him he’s in the province of New York. Roger finally gets a word in, asking why Ferrigault also landed in the hut of shame. The holy man is also guilty of falling in love. Marsali catches Fergus in his plans to rescue Murtagh. She tells him she’d only be mad at him if he didn’t at least try to save our silver fox. Fergus looks at her as if she’s a goddess that he’s fortunate enough to share air with. They wonder what Jamie and Claire would do. These two haven’t had a lot of scenes this season, but I believe in their love every time I see them. Their relationship is truly underrated! They agree that it would probably be in their best interest to move to Fraser’s Ridge after they bust Murtagh out of jail. Aren’t they the cutest lil criminals? Jamie and Claire always find a way. So will Fergus and Marsali. Ferigault regales his tale with shame to Roger. Having met the tribe as a missionary, he lived peacefully among them, even successfully converting some of the tribe. Everything was going FINE until he fell ill. He admits to the biggest sin on Earth, falling in love. The woman who nursed him back to health loved him as well. They consummated their feelings, and the woman had a child from their union. That’s right. He fell hard for Johiehon. The Mohawk were not so pleased when they discovered that Ferigault in his guilt, could not baptize his child. He is already damned for life. Why would he do the same thing to his own child? Ferigault prayed that he would stop dreaming of the woman he loves. He confesses that he has been unsuccessful. Roger watches in horror as the Mohawk strip his fellow prisoner down to nothing and drags him out of the hut. They drag him back inside later, with his ear cut off. Roger pulls a Doctor Claire and is like, ‘This will hurt me more than it hurts you’ as he attempts to clean the wound. The Mohawk are giving Ferrigault one more chance to baptize his child. If he refuses, they will burn him alive. Ferrigault would know and that’s literally the only thing stopping him from saving his own life. At the end of his rope, Roger finally snaps. All jokes aside, Richard Rankin absolutely killed this scene. He still loves Brianna, but he needs to learn how to love himself again. Roger has discovered a way the two can escape. Will Ferrigault allow himself to be forgiven and join Roger or be resigned to a horrible death? Ferigault joins in the digging. They’ve made progress by the time morning arrives, but it’s not enough. Ferrigault realizes that he can buy Roger more time if he gives himself up to the Mohawk. Brianna is finally ready to face Bonnet. Unbeknownst to them, the Regulators are slyly laying gunpowder around the jail. 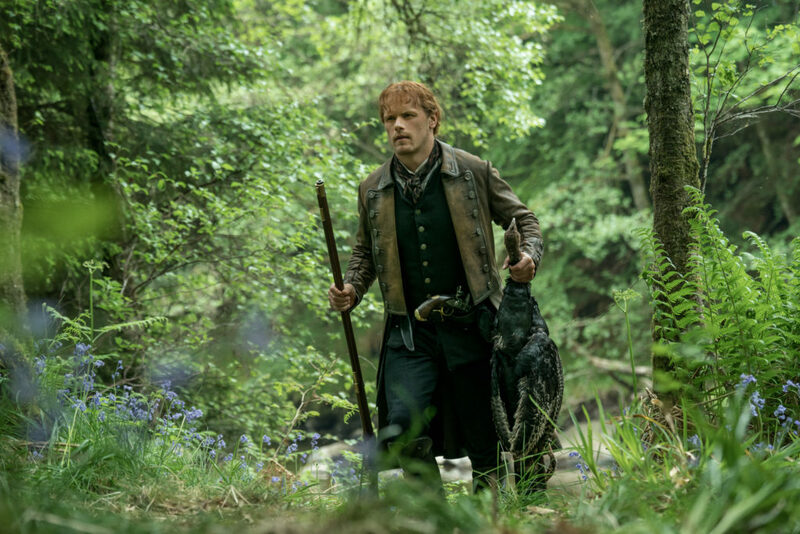 I love the shot of Fergus joining the fray, leading the Murtagh rescue effort. I wanted to pull a Murtagh and punch Bonnet when he callously told Brianna he remembered her face and other parts. Brianna reveals that Bonnet may have left a living legacy on Earth. Bonnet gives her child support in the form of one of his gems. Ed Speelers plays the master manipulator with ease, and you could see how anyone would fall for his charms. I still totally want Bonnet to die. Brianna and Lord John are interrupted by the Regulators attempting to bust Murtagh out of jail. Murtagh is of course incredibly pleased to be reunited with Lord John. They don’t have a lot of time to exchange the pleasantries they obviously want to convey because the jail is literally about to blow. Bonnet is last seen trying to grab keys. He totally didn’t die, did he? Unfortunately, the event occurred with sudden rapidity is literally going to be my excuse for not seeing anything from now on. Lord John does Murtagh a solid and doesn’t reveal that he knew he escaped. Roger has a chance to escape but can’t stand to hear Ferrigault screaming in pain. Cursing himself for his idiocy, he runs back to Shadow Lake. Seizing the momentary advantage of surprise, he grabs a barrel of alcohol and tosses it on Ferrigault’s fiery pyre. Johiehon watches in tears as the flames engulf him. Roger has saved Ferrigault from suffering too long, but he never anticipated that SHE WOULD JUMP IN THE FLAMES TO DIE WITH HIM. Kaheroton tenderly grabs her baby and watches the lovers burn to death. Roger gets dragged away, a prisoner once more. The road to hell is certainly paved with good intentions. Bravo to Richard Rankin. He killed it. The only bad thing I have to say about this episode was that it wasn’t long enough! I did certainly miss Jamie and Claire. I certainly would love to see them return with Roger in tow in time to help Brianna give birth! Because they totally will rescue Roger. Right? I am curious to see how this entire ordeal will change the dynamic between Roger and Brianna. Things will not be the same between them, but as long as they’re together again I’ll be a happy recap reviewer! I really appreciated the fact that Roger was deeply mad at himself for still being in love with Brianna in spite of all the crap he’s been through. Richard Rankin did a fantastic job of conveying Roger’s anguish, and his inability not to run away from doing the right thing. I also would’ve loved to have seen more of Johiehon! I thought the actress, Sera-Lys McArthur did a great job in the few scenes she was in. That’s the ONLY problem I have with Outlander y’all! There are too many likable characters! I want spinoffs for them all, plus extra Jamie and Claire time of course. With a show like Outlander, only time will tell. I canna say if I shall see you again. My hope is that it is so and that all shall be mended between us. I’ve been thinking about your question whether revenge will heal the wrong done to ye. I advise ye that you must not seek it, for the sake of your soul. For the sake of your own life you must find the grace to forgive. Freedom is hard won but it is not the fruit of murder. Do not fear that he will escape vengeance. Such a man carries within him the seeds of his own destruction. If he does not die by my hand it will be by another. But it must not be by your hand. Hear me for the sake of the love I bear you. This entry was posted in Caitriona Balfe, César Domboy, David Berry, Duncan Lacroix, Ed Speleers, Episode Reviews/Recaps, John Bell, Karen Campbell, Lauren Lyle, Mairzee Almas, Richard Rankin, Sam Heughan, Sophie Skelton and tagged Braeden Clarke, Caitriona Balfe, Carmen Moore, César Domboy, Duncan Lacroix, Ed Speleers, Episode Reviews/Recaps, Gregory Dominic Odjig, John Bell, Karen Campbell, Lauren Lyle, Mairzee Almas, Providence, Richard Rankin, Sam Heughan, Season Four, Sera-Lys McArthur, Sophie Skelton, Tom Jackson, Yan Tual by Katherine Stinson. Bookmark the permalink.